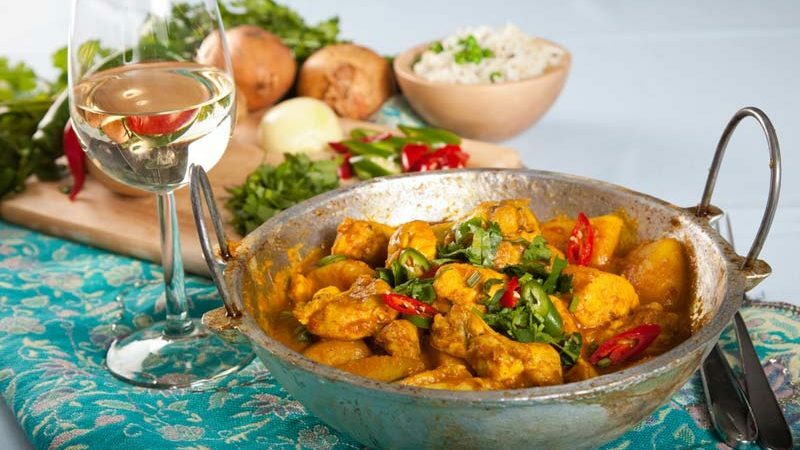 While most people would probably prefer to drink a large glass of milk rather than wine with a hot curry, in a restaurant, it’s not always a possibility. And, if you’re not a huge fan of Mango Lassi or a refreshing Lager, you will still be hoping that a glass of wine, or a bulk number of bottles if you buy online wine, can quench your thirst and relieve the fire on your taste buds. However, as you will quickly realise – be it at home or a restaurant – not every wine you drink with curry is going to be suitable. Some, in fact, intensify the heat or change the flavour of your meal entirely. If you’re determined that you’ll be ordering something off the wine list, here are a few tips and tricks to help you make the right choice. There are so many different types of curry depending on the culture, country, heat intensity, and the protein you choose to include as well. Therefore, there is no “one size fits all” approach to choosing wine for curry in general. What works for chicken tikka masala, for example, won’t work for Thai red roast duck curry. Therefore, before you go ahead and choose your wine, consider the heat levels, the protein, the richness of the spices, and the culture from which it comes. 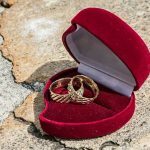 These can all help you make the right decision. Because you’re sure to find your curry is a little on the spicy side, your aim is, of course, going to be to relieve some of that fire in your mouth and cleanse your palate at the same time. To achieve that, you’ll need a refreshing wine that contrasts against the heat of the curry, as well as a touch of sweetness. Wine with added sweetness is more than suitable for exceptionally hot curries such as Thai green curry. What you’ll need to avoid, however, is high-alcohol wines. The ripeness and oakiness of these wines tend to send the spices of your curry off-kilter, altering the taste of both the wine and the curry in your mouth. If you’re buying your bottles from an online wine store, be sure to read the descriptions of each bottle to make sure it’s going to work with your curry of choice. What Wine Should I Drink with Curry? Now that you know that there’s quite a science involved in choosing wine to accompany a curry dish, there are a few stand-out options. 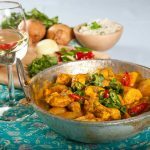 Riesling, the off-dry variety, is going to be a winner, particularly for light protein curries such as fish, chicken, and vegetarian options. If you have a choice of origin, steer toward Riesling from Australia, New Zealand, or even Germany. You can buy these from most online wine providers. If you need help making it through a hot green curry, a New Zealand Alsace will work a treat. It not only takes the edge off a Thai green curry but alleviates discomfort with hot Indian meals as well. If you’re not a white wine fan, then there are very few red varieties in a restaurant that will work overly well with curry. Something with a tang of fruit such as Pinotage or even Carmenere could be a good option. Avoid anything that’s too high in alcohol, tannin, or has an oaky flavour. Pairing wine with curry can be a challenge, but if you take note of the options above, you may find it’s easier than you think. If all else fails, there’s always the option of a Mango Lassi or that refreshing glass of Lager.